Those who are left behind: Each December in Los Angeles County, the ashes of the dead who have been left unclaimed for three years are buried in one massive grave. 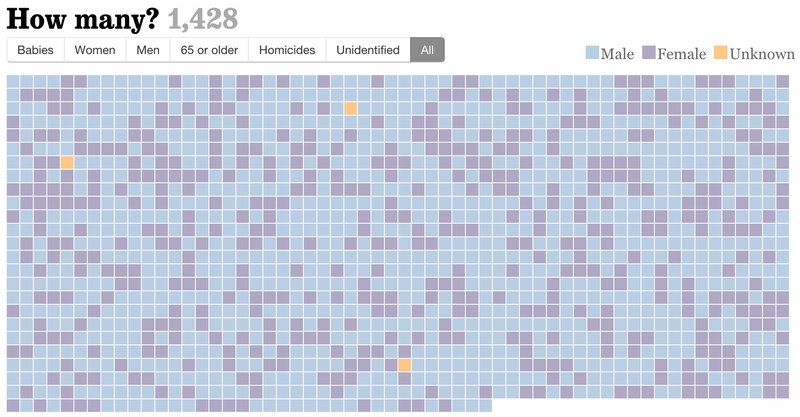 Partly to provide an opportunity for readers to call the county morgue and claim remains, and partly to provide an insight into who goes unclaimed, Maloy Moore and Jon Schleuss at the Los Angeles Times wrote up the details on all 1,428 individuals who were unclaimed as of late October. Mapping marriages: Ever wondered which counties in America have more unmarried adults than married ones? Nathan Yau of Flowing Data did, so he used data from the American Community Survey on marital status and mapped it at the community level. The results show the most separated, most divorced, most widowed and most married counties in the United States. Fedspeak: If you find monetary policy opaque, you’re probably not alone. 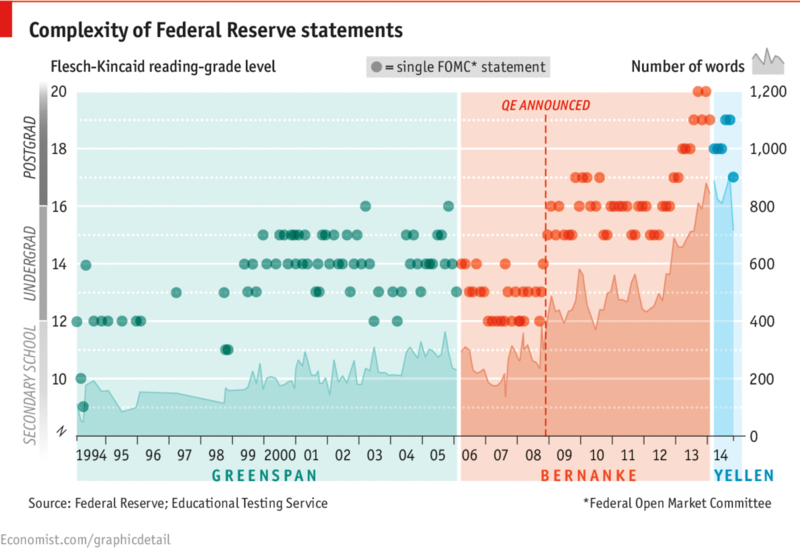 The Economist’s data team used the Flesch-Kincaid grade level (which tells you how many years of education you would need to be able to understand a piece of text) and overall word count to measure how statements from the Federal Reserve have changed over time. The results, shown in the chart below, reveal how the Fed’s language has become increasingly complex over time — with higher word counts, more syllables per word and longer sentences. In fact, if you don’t have four years of postgraduate education, chances are you won’t have understood at least two of the press statements issued by the Fed last year.